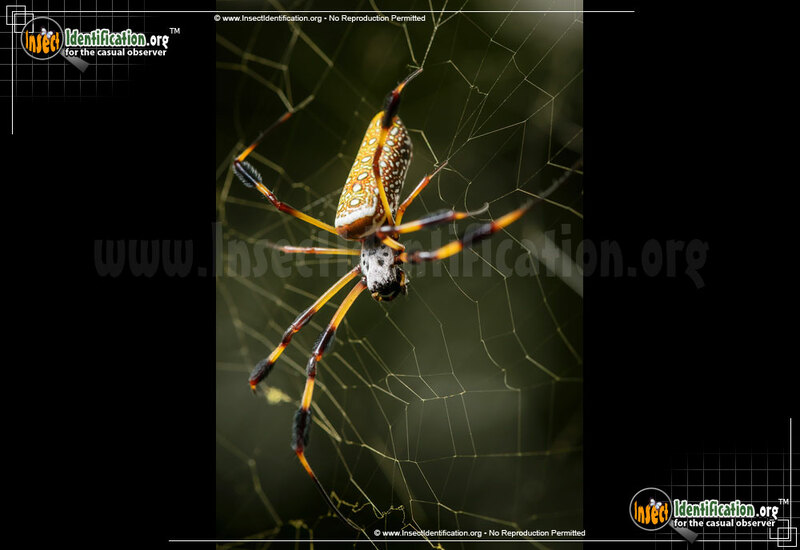 Detailing the physical features, habits, territorial reach and other identifying qualities of the Golden Silk Orbweaver. The intimidating and multi-colored Golden Silk Orbweaver is not as mean as it looks and is far more docile than its South American relative. The size of this spider can be alarming. While males remain quite small (up to 1/4 inch), females can grow to become 7.6 cm (3 inches) long, not including legs. They build webs up to 3 feet in diameter and sit, head-down, right smack in the center of them. This spider does not hide from its prey. Its tubular abdomen is a golden, orange color with a row line of paired white dots running the length of it. Side speckles and white dashes fill in the space around them. Spindly legs are long and also gold with brown bands. 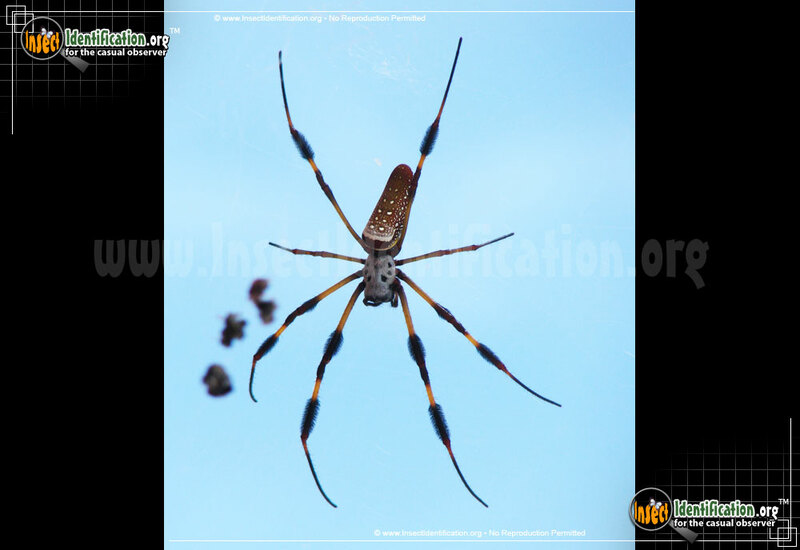 The abdomen of this spider is shaped somewhat like a banana and the 1st, 2nd and 4th pairs of legs have black tufts of hair on them. 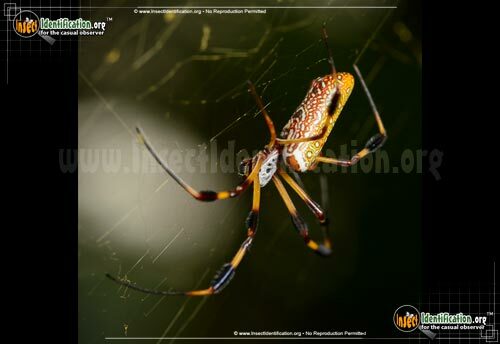 The Golden Silk Orbweaver is a tropical climate spider. Its name comes from the color of its spider silk. The threads have a yellowish hue to them. The collection of the spider silk to produce usable fabric proved too time and labor consuming to pursue. 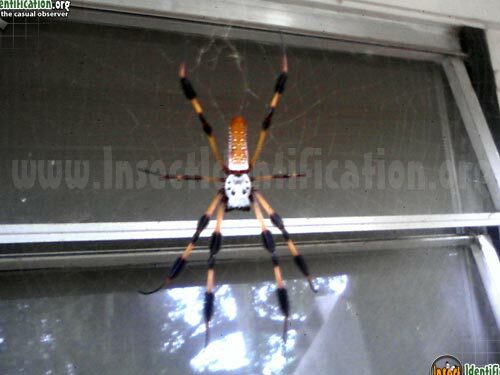 This spider prefers humidity and it found in the Southeastern U.S.. 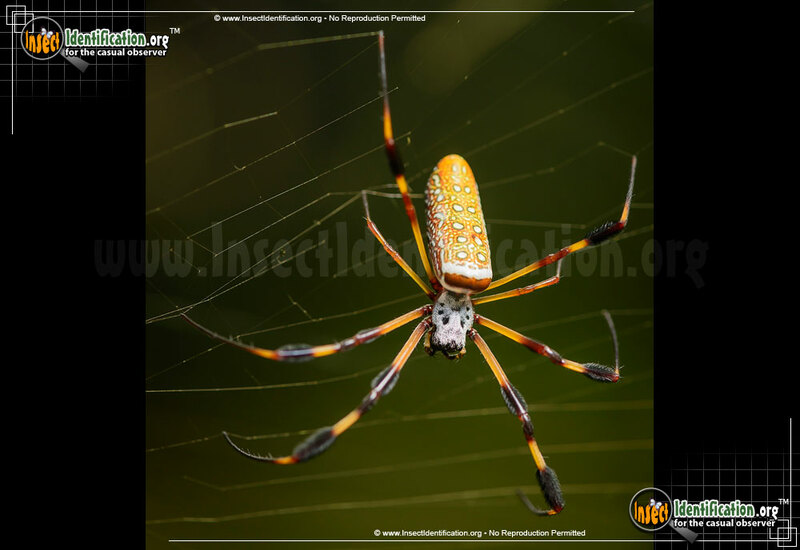 Sometimes called a Banana Spider because of its abdomen's shape, it is not the same species as the aggressive Brazilian banana spider known for surprising and biting people handling its retreat formed between bananas. Our North American species is not aggressive and considered relatively harmless, meaning it may bite if threatened, but it does not have poisonous venom. 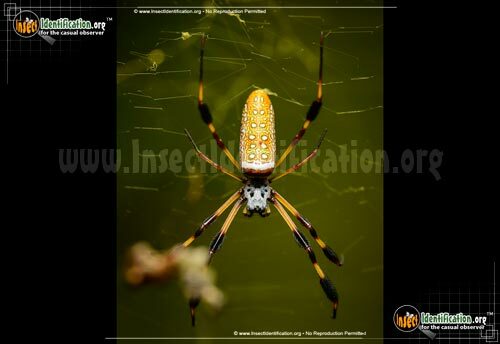 They are found in swamps or shady woods, weaving webs that are on a slight incline as opposed to straight up-and-down with the ground like other orb weavers. 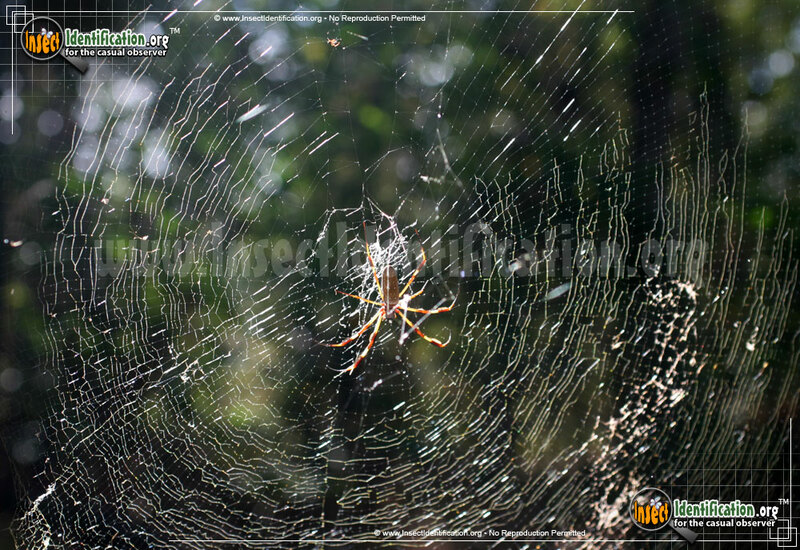 These golden webs may look incomplete, lacking a perfect circular shape. Males are often seen on off to the side of a female's web, or perhaps sitting on her. 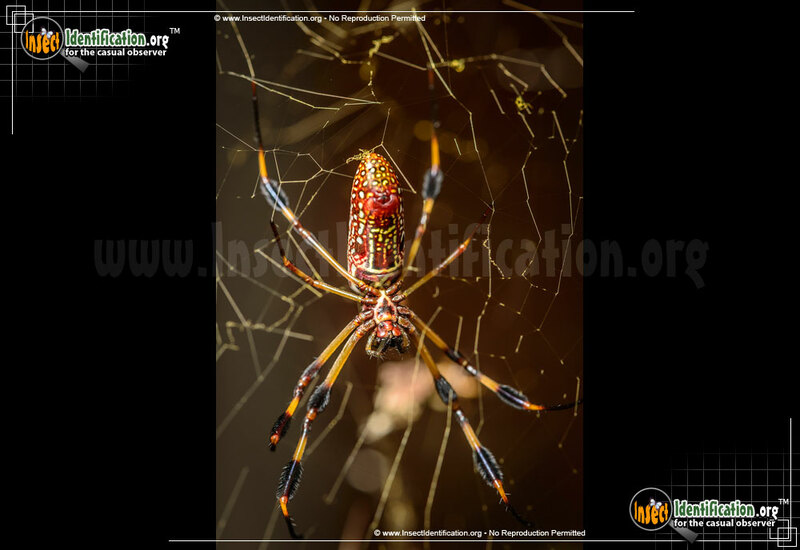 As an orbweaver, this species rebuilds part of its web every day, though Golden Silk Orbweavers may need a few nights to rebuild the entire massive web. This species is an excellent guard for flower and vegetable gardens. The placement of their webs over areas that require harvesting may prove a bit annoying and difficult for a gardener, but a Golden Silk Orbweaver should be encouraged to hang around.